For the past few months, we’ve been working on a book about Haskell. Specifically, we’ve been writing about Haskell’s Maybe data type, which is used to represent values that may or may not be present. This is the Haskell alternative to Ruby’s nil. You’ll find a similar concept in other languages: Scala, OCaml, and most recently Swift’s Optionals. If you’re interested in Functional Programming, Haskell, or the idea of living in a null-free world, this book should be a great introduction for you. It assumes no prior Haskell knowledge and introduces you to only the parts of the language needed to get into what’s really cool about Maybe (and yes, we’ll talk about Monads). 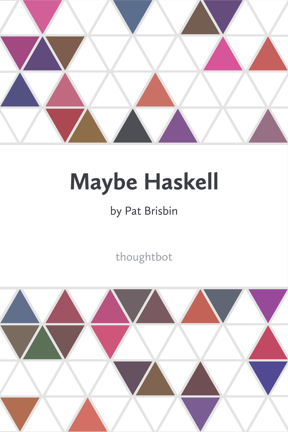 We’re very excited to announce that Maybe Haskell is ready for public beta. This is an early-stage release. The content is still evolving and you may find grammatical or technical errors as we continue to write and review. What you’re getting is access to the actual GitHub repository where we’re working on the book. This is a great way to get in early and help shape the content. As we change and add things, you’ll be able to see it in real time, comment on Pull Requests, or provide feedback as Issues. To see the current Table of Contents, get a sample of the book, and buy access to the GitHub repository, please head over to maybe-haskell.com. How Much Should I Refactor? Have you ever wanted to to program without nil? Learn about Haskell's Maybe data type in our new book Maybe Haskell to start living in a null-free world. You'll find this concept useful whether you program in Haskell, Scala, OCaml, or are a heavy user of Swift's Optionals.